The loss of the fingers on his right hand inspired South African Richard van As to create something very special: a charity to bring prosthetics to those who cannot afford them. “Robohand creates 3D printed and aluminium CNC machined, anatomically driven, custom fitted, mechanical devices to help limb different individuals as an alternative to standard prosthetics,” the website explains. The charity, which started in South Africa, now has operations in the US and Australia and is able to offer prosthetic limbs at a fraction of the cost – and it is not the only one of its kind. David Krupa, lifelong amputee, CEO and founder of ROMP, a Denver-based non-profit that provides much needed prosthetics care to patients in Guatemala, Ecuador and Mexico, says that 3D printing is being used in a number of ways. ROMP is using 3D printing to rapid prototype electrically powered prosthetic hands, and to fabricate mechanical hands, upper extremity parts, and moulds that can be used to create silicone prosthetic elements. “3D printing technology is relatively inexpensive and helps us to move quickly through the product development stage. Finally, ROMP uses 3D printers to create test sockets for our patients. The socket is custom moulded to every patient and is the part of the prosthesis that connects directly to the amputated limb,” he says. ROMP co-developed a 3D printed mechanical hand with the University of Victoria Canada. This hand costs less than functionally comparable hands on the market and they’ve already deployed a dozen units in Ecuador and Guatemala. By using 3D printed test sockets they are improving the fit of the final prosthesis while lowering the production costs, meaning that, in some cases, 3D printing lowers the final cost of the prosthesis while improving quality. Krupa emphasises the need not only to enable poorer amputees to access prosthetics, but to ensure that those prosthetics are right for them. In addition, with an appropriate cost of fabrication and and delivery of prostheses, technology promotes sustainability in a prosthetist's career, which means he or she can continue serving his or her patient population throughout their lives. John Kawola, Ultimaker President: North America, says that medical 3D printing has democratised the market, where manufacturing tools are more accessible and commonly available. “It is now possible for a father, a teacher, or an expert by experience to have a real impact on a child who is in need of a prosthetic hand,” he says. Ultimaker has become actively involved e-NABLE through participating in meetings and conferences, by promoting and telling the story as well as providing software and technical support to better improve the project. e-NABLE started as a follow up to the Robohand project that was the result of a collaboration between Ivan Owen (US) and Richard van As (South Africa). “With e-NABLE, kids can now grow up learning to use a hand device, gain more self-esteem and even get involved with making their own prosthetics,” Kawola says. 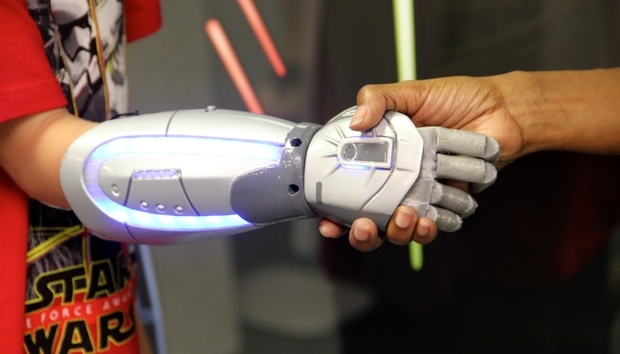 Jesse Harrington-Au, Autodesk 3D printing expert, explains that 3D printed limbs is a massive step forward from anything that has gone before. They are a fraction of the weight of traditional prosthetics as they’re made using lighter nylon or titanium meshes, instead of heavy, mass-produced solid plastic. They are also easily customised to the user’s body, which not only radically improves comfort but also means they can be designed with fashion in mind, helping empower individuals, especially kids. “With the launch of 3D printing hubs and networks by companies such as e-NABLE, 3D printed prosthetics are now much more accessible. Individuals across the globe can 3D print custom made prosthetics – such as hands, legs or feet – at home. This is a great advancement because it means if something breaks, you can replace it easily. For kids this is especially important, as they quickly grow out of their prosthetic limbs,” Harrington-Au says. Closer to home, Open Bionics is also developing advanced bionic hands for amputees at the fraction of the cost of current robotic prosthetics. At the moment, the UK’s NHS does not offer a multi-grip bionic hand for amputees because the expense is too much. Open Bionics uses emerging 3D technologies such as 3D scanning and 3D printing to rapidly reduce the cost of producing custom bionic prosthetics. The company says it will also share all of its research, development, and designs for free online, enabling communities around the world to take advantage of its developments. An advanced prosthesis designed in the UK could be downloaded, 3D printed and assembled anywhere in the world. For Open Bionics, the real challenges are being able to offer a powered multi-grip bionic hand that can greatly increase quality of life for an affordable cost when components such as motors, and batteries are expensive. Technology is making such initiatives easier, quicker and cheaper. Adam Clark, the founder and CEO of Tangible Solutions, a consultancy and provider of 3D printing, additive manufacturing & engineering design services, explained that organisations have been using additive manufacturing to decrease lead times and reduce costs during development cycle of their products, and now there is a shift to on-demand production. “This style of just-in-time (JIT) manufacturing is particularly advantageous to custom fit applications. Coupled with other technologies like 3D scanning, additive manufacturing is becoming the tool of choice for custom medical applications – from low-cost thermoplastic prosthetics through titanium orthopaedic implants,” he says. Additive manufacturing means that multiple projects can be placed on a build plate at the same time, allowing AM Service Companies to produce any number of customised parts at the same time, side-by-side. Clark says that not only will 3D scanning and printing combined with additive manufacturing lower the overall cost of prosthetics, it will also allow patients to receive prosthetics more often as they grow and change, increasing comfort as their bodies grow and change. Macfarlane adds that as 3D printing becomes cheaper and more widely adopted, offering 3D printed limbs as an alternative to traditional prosthetic limbs will become much more common. Price will be the biggest driver to adoption – a 3D printer and materials can be bought for around $350 to $500, while the average cost of prosthetics ranges from $2,500 - $60,000. “Temporary prosthetics with cheaper 3D printers using ABS plastic (like Lego) and open source 3D models are more accessible, mobile and easy to operate without a steep tech learning curve. The trade-off is perhaps a less robust prosthetic – versus carbon fibre or titanium – but the upside is you can print off replacement parts relatively quickly and cheaply. It’s cheaper to produce products with a flexible less expensive replacement process,” says Macfarlane. There are, of course, 3D printers that can print in carbon fibre, graphite reinforced plastic and in metal. Their costs do go over $6,000 but, Macfarlane emphasises, it is still cheaper than a $60,000 custom job. “One theme on the plus side is that we’re moving towards people printing their own prosthetics at home, replacing their own parts and making different of prosthetics for themselves for different occasions and uses. Taking ownership of their condition and managing it without breaking the bank,” Macfarlane says. He expects it to be a few more years before we see 3D printed limbs becoming the de-facto choice for surgeons and their patients. There are a number of significant challenges the industry needs to overcome first. However, the barriers to entry are coming down. The time to test products is continually falling, as is the access to funding, open source code and tech incubators, all of which are crucial to driving tech innovation. Furthermore, marketing products through social media and marketing to a global audience mean that bringing a product to market is a lot more accessible than ever. More significantly, though, the core challenge with 3D printing in prosthetics is that the printable materials are generally not strong enough for weight bearing activities. “Most of our patients are lower extremity amputees,” says Krupa, “and most 3D printed elements will break due to the forces generated during walking.” What is needed is stronger options for 3D printing. Krupa believes that materials will improve and so too will the strength ratings of printed parts. “This will allow us to fabricate more definitive prosthetic components at progressively lower costs,” he says, adding that 3D printers will also allow prosthetists to treat more patients. Harrington-Au believes that the future holds even more developments for 3D printed prosthetics. New materials are being created which will make them even lighter and more durable. “We’ll also start to see limbs fitted with a range of sensors and other electronics. For example, prosthetics could be fitted with heat sensors, heart monitors that can act like a built in FitBit, or even a torch,” he says. These sensors and additions not only assist in creating more human acting hands but also can help to enhance the user. Projects like Super Hero Cyborg have kids working with designers and engineers to make modifications to add things like tennis rackets and Sparkle Cannons empowering the user to feel even stronger than before. Like Harrington-Au, Kawola believes that the prosthetics will gain more degrees of freedom and may even grow to become more advanced, with perhaps bionic capability, connected to muscles and responding to muscle movement in the forearm. “Most people foresee options to connecting to Wi-Fi, making the arm smarter and more adaptable to daily life,” he says.